What is a store cupboard standby that can be dressed up in any way with any ingredient you happen to have and can be as homely or as luxurious as you want? Risotto, of course. 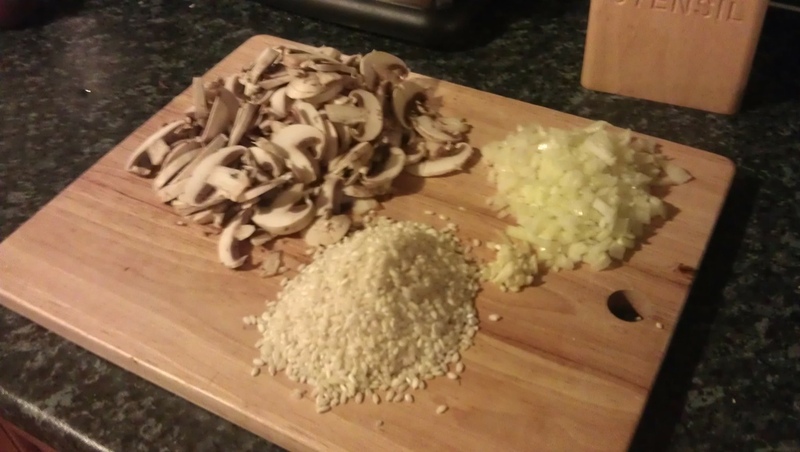 We love risotto in our house and, on a night when we just didn’t know what to have, it was a perfect Sunday solution. Today’s version was quite simple with only six ingredients: arborio rice, onion, garlic, mushrooms, bacon and chicken stock. I have since – as in in the last 20 minutes – learned that arborio rice is not the ideal rice for making risotto as it apparently is stodgier and more starchy than carnaroli rice, the rice recommended by Antonio Carluccio himself. If I’m going to trust anyone about what rice to use for the perfect risotto, I think it’ll be him. •Don’t let the rice or onions brown – the onions because they will ruin the flavor and the rice because it apparently locks in the starch. Not ideal when the success of the dish hinges on the starchiness of the rice! •A girariso, a spatula with a hole in the middle, basically doubles your stirring power by allowing the rice to move in two directions at once – in front of it and through it – releasing more starch from the grains and thus giving you a creamier texture. •Once you’ve taken the rice off the heat and added the cheese and butter, stir the heck out of it. The Italian word for this is mantecatura and allows the remaining starch to be released from the rice as well as allowing the ingredients to bind fully together. Although I don’t yet have a girariso, having just learned it is the ultimate risotto utensil, the result was very tasty and had the desired ‘wave’ effect or fara l’onda. I think it is a matter of just standing there for 20 minutes stirring, adding ladlefuls of hot stock as each is absorbed. Once you come to terms with that fact and don’t try to rush the process, you can bet you’ll make good risotto every time.